St. Patrick School offers both a half-day Pre-Kindergarten program and an optional afternoon Pre-K Enrichment program to best meet the needs of three and four-year olds at a variety of social, emotional and academic levels. 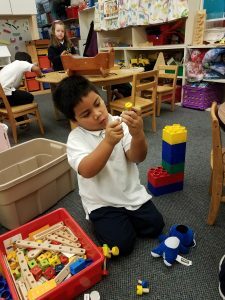 Read about our Pre-Kindergarten Program below and learn more about our half-day Pre-Kindergarten Program here. St. Patrick School has been a vibrant presence in Tacoma’s North End for more than 120 years. Experience encourages excellence. Our program is designed to provide activities appropriate to encourage independence and the social, emotional, spiritual, physical and intellectual growth of every student. Pre-K classes are directed by certified Pre-K educators who are assisted by aides. We hold our Pre-K aids to the same high standards as all our other teachers. The classes use the pre-school level language arts curriculum, designed by Houghton/Mifflin, that continues through eighth grade at St. Pat’s. Stories, art, music, and poetry combine in a whole language program that stresses letter shape and development of phonetic skills. Our science curriculum was designed by the Lakeshore. It uses scientific language and stresses observation of nature and participation in experiments to explain the world. The social studies curriculum stresses recognition of time periods and holidays. Daily counting, patterning, and sequencing, are included in the math curriculum. Students learn religion as they celebrate the major Christian holidays, sing and pray together, and participate joyfully in the spiritual life of the larger community of the school. Students draw, color, and use scissors to develop writing skills. They practice letters, and in some cases, words. Students practice social skills during recesses on a playground designed and reserved for the exclusive use of Pre-Kindergarten. Children also practice these skills during periods of free activity choices during the school day. Teachers lead many activities designed to encourage early reading and the development of language and school skills. Specialists at St. Pat’s provide weekly instruction in art, physical education, computer science, library science, and music. Students in Pre-K classes also participate in many enrichment opportunities. In addition to the optional hot lunch program, concerts, plays, prayer services and presentations from the Pacific Science Center and community leaders are available to our students. A popular Extended Care Program is available before and after school at St. Pat’s. A snack and supervised outdoor play time on the school’s giant big toy are available at Extended Care for Pre-K students.